File and group specific options can be set through the Context Menu of the item. Open the window Project, right-click the item, and select Options for item…. The dialog controls depend on the device selected and, consequently, will vary. The dialog pages have tri-state controls. If a control is grayed out or is set to <default>, the parent item settings are active. The fields are described in the section Properties. 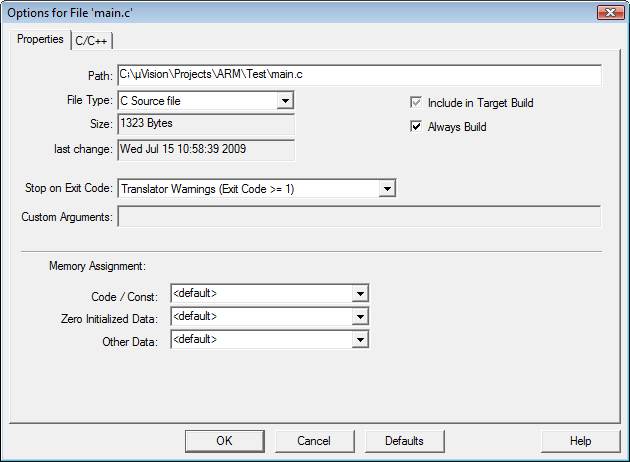 In this example, the option Stop on Exit Code, specified for main.c, stops the build process when translator warnings occur. Always Build translates the file with each build process, regardless of modifications.